$$$ Download: Amano MJR-8000 Totalizer Time Clock Quick Reference Guide. The Amano MJR-8000 is the unrivaled champion and workhorse of all calculating time clocks. 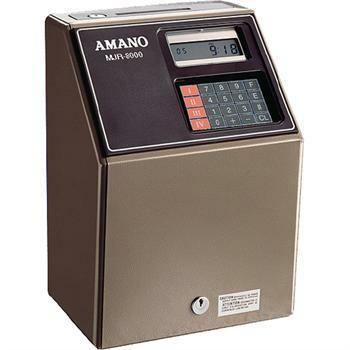 Simply the best of the best when it comes to totalizers, the Amano MJR-8000 is a reliable time clock that does the calculations for you and will give you years of service. It's durable steel case, steel frame and superior electronics and design make this THE time clock that can be used by companies of all sizes and environments. The MJR8000 accommodates up to 250 employees (see the Amano MJR-7000 for up to 100 employees) and has features and a track record of reliability no other time totalizing time recorder can match. If you want the best clock of all calculating time recorders, look no further, the MJR series is truly the top-of-the-line.